In the Martial Arts you hear and read about people who have used their Martial Art to physically defend themselves in a real situation. Often the defender could very easily have avoided the entire situation but instead due to any number of circumstances they ended up in a fight instead. I recently read an article by Nev Sagiba related to this topic and decided to add my 2 cents worth. First of all, a physical attack is actually implemented when someone is actually closing the distance towards you or those you care about (or are in some way responsible for) and they are on their way to strike, stab, grab, beat or otherwise immediately hurt them or you Right NOW! For this to actually be a physical attack they also must be close enough that within seconds they can actually begin contact and the physical aspect of the attack is imminent. A person who throws their fists up and threatens to beat you up is verbally attacking and physically posturing but not yet physically attacking. A person who is upset and yelling is upset or/and threatening and posturing is verbally attacking but not yet physically attacking. A person swearing at you is verbally attacking and posturing but not yet physically attacking. A person who is busting things in the room or kicking your car is posturing and attacking things but is not yet physically attacking you. You get the idea. When I began learning martial arts a lot of what I learned taught a person how to engage in a fight. Fortunately for me my instructor was also very street-wise and taught me as much about street fighting as he did about the arts. Part of his training included the idea of getting out of there and using any unfair advantage you could get to win a serious physical confrontation. I also found that when I was threatened with a fist fight that I did not just jump in there swinging away like a mad man but that instead I had a tendency to utilize positioning and verbal skills to try to deter my would be attacker. Due to attacks, that I personally experienced, I also found that when I needed to defend myself that techniques that would allow me to quickly end a physical confrontation and get out of there were much more important to me than being able to exchange a lot of punches and kicks. This was partially due to the fact that even in school yard fist fights the average fight involved multiple attackers and if I got tangled up with someone the next thing I knew their buddies were also all over me. My findings and understanding of what happens in real situations eventually led me to Pentjak Silat, Kun Tao and Kun Tao Silat as the arts that I needed to deal with the harsh realities of surviving street encounters. When a person attacks you verbally (yelling and threatening) or non-verbally (such as waving their fists) then a response of some kind is still called for. Generally speaking the response is fairly simple. Either work to help end and bring an acceptable solution/conclusion to the problem or simply remove yourself from the situation by running or driving away. Awareness is key. If I have parked my car in a parking space that another driver has perceived as their parking spot and they are cussing me out all I have to do is move my car so that the other person can park there. It is inconvenient but not worth the trouble that would be created by allowing the situation to escalate to a physical confrontation. By the way, to fight with someone about this type of a situation would not be an attack as much as an agreed upon fight. When someone is a victim of “Road Rage” by another driver there are many responses that a person can choose. One of the responses is to pull over and physically fight with them. As soon as you pull over and jump out of your car ready to fist fight this becomes an agreed upon fight and not a physical attack. The drunk person who grabs your wrist to ask you for money may not be attacking to kill you but they are definitely physically assaulting and attacking you. This does not mean that you need to seriously maim or kill them but it does give you the right to dump them on their tail and disengage yourself from them. If it is obvious that they mean no harm then I generally do not consider this as an attack. If their intentions are unclear in a potentially threatening way or seem threatening then I do consider it an attack and will treat it as such. Utilize Awareness to the extent that you see the drunk person before they are close enough to put a hand on you and you simply do not allow them to touch you and when you are parking your car see where other traffic is so that you know if someone else thought the spot was theirs before you are in the parking spot properly lining up your car between the lines. Also and very importantly, if someone is approaching so they can physically attack you then awareness can make all the difference. You see the person approaching and remove yourself completely by driving or jogging away. If the attacker is attacking you at random then this generally ends the situation. Getting away is our first line of defense and the easiest to use with the least consequences after the fact. Good awareness skills are vital and properly utilizing them will stop most situations from becoming a physical attack. I have been attacked about 15 times in the street. Two of the attacks were at gunpoint and fortunately for me were primarily verbal attacks and only one became physical when I grabbed the guy. The other one gun assault ended with no physical altercation as I simply talked to the guy and literally calmed him down. About six of the attacks were from multiple attackers and most of them involved a situation where the physical aspect of the attack was fairly immediate without warning or provocation. An example is a car screeched to a stop and out poured 4-5 guys running to attack me. I was in the wrong part of town and stood out like a sore thumb. The attack was most likely racially motivated but could have easily happened for other reasons as well as I was leaving a job where I was dressed very nicely in a suit in a very poor and financially depressed area of town in a large inner city area. I have had a knife pulled on me about 5 times. Fortunately, only one of these were a direct physical assault and most of them were what I like to call “show and tell” verbal assaults. The interesting thing is that in most of the knife assaults were multiple attacker situations where one person held the knife and threatened while others with them watched and backed them up. The bad news is that fairly common street tactic is for the group to hold you down while the person with the knife stabs you to death. By being aware of my surroundings only in the first of these attacks (which happened when I was 12 years old) did the attackers actually get within reach of me. Fortunately, it was only a robbery and I gave them my money and stuff and they were satisfied. For me this event was pivotal in my personal development of awareness and I was not ever caught that unaware or unprepared again. Eventually I grew up, graduated from college and moved away from the bad neighborhoods I grew up in but then for many years I lived and worked in Tampa Florida while it was the number 4 worst crime city in America. Eventually, I moved to a rural area with less crime and less people. Not a luxury everyone can afford and if they could then, of course, eventually the crime would follow them. I realized at a very young age that if attacked by someone who would kill me in order to get a few dollars for drug money I would have to be willing to fight for my life and that it might mean seriously injuring or killing them to stop them. A person who is high might be seriously wounded and have a life ending injury and yet keep attacking without any realization of how seriously bad off they are. If you assume they will stop and they don’t it is possible that the attacker just might take you to the grave with them. In our style of martial arts Clear’s Silat based on Pentjak Silat, Kun Tao and Kun Tao Silat we work very hard to avoid and non-violently end confrontations but when lethal force is necessary against violent street lethal attackers we do not pretend that there is some humane way to end the situation. We try to get away as fast and early as possible. 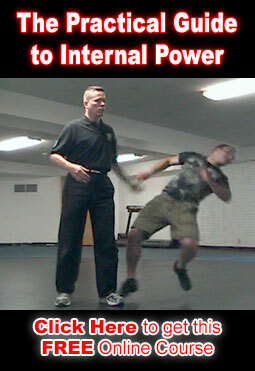 If it is not possible to get away then we do the maximum amount of damage in the absolute shortest amount of time possible with the goal being to get away and in our style of martial arts we practice exiting and getting away after any serious technique as the escape is the goal and the damage we inflict is simply one very serious tool in our arsenal to accomplish this end. This is the only way to survive against serious multiple attackers who will kill you and beat you to death without hesitation and then laugh about it later over Malt Liquor or shots of whiskey/tequila while smoking some crack. Criminals do not believe in a fair fight and they hope the intended victim does as it is an incredible advantage to them in a real situation. Hopefully you will be good at awareness and avoiding bad situations but if you are seriously attacked play to survive not to be friendly or fair to a hardened criminal who would think nothing of killing you or your loved ones. Clear’s Silat is the personal mix of Street Tactics, Pentjak Silat, Kun Tao and Kun Tao Silat devised by Richard Clear a practitioner of the arts for over 30 years. The art is based around surprise attacks by multiple attackers who are armed with weapons particularly blades and sticks such as baseball bats and utilizes avoidance and awareness techniques as well as physical tactics that are designed to immediately end a physical assault. I find that remaining calm, speaking in a normal voice, arms crossed or hands in pockets usually calms the other person as he sees no threat from you, but at the same time be on guard, prepared for possible attack.